Conduct experiments in linear expansion, determine specific heats, test thermometers, and more with the steam produced by this generator. A boiler with manometer tube on the side shows the water level inside the unit. The apparatus features an outlet tube in the body of the boiler, a straight tube with a base that will screw on to the boiler itself, a cap to cover the hole in the boiler, and a small dipper which fits into the hole in the boiler to carry lead or other metals when they’re being heated. A sturdy tripod supports the unit and a gauge on the side allows users to monitor the amount of water in the boiler at all times. Includes instructions. Size: Can: 7"H x 4" Dia. 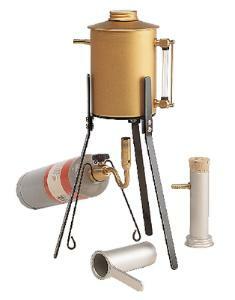 ; Stand: 9"H.
Ordering information: Required but not included: Butane torch or Bunsen burner.